Wishing everyone a merry Christmas and a happy new year 2011!! Today is my granddaughter's seventh birthday. It was also the day her first grade class put on a little Christmas show. Those kids were so adorable I'm breaking my face grinning so at the memory. They sang and acted out a variety of songs which included the "Hot Chocolate" song from the Polar Express movie and a song called "Christmas Twist" in which the little darlings danced like (they thought) their grandparents once did. It was a joy altogether and a nice kickoff for the season. I'll add my best wishes for a happy holiday time to all the family of MoMers! Merry Christmas to all! This Saturday I am getting my second tattoo, a small clamshell on my right ankle. It's been over 8 years since I got my dragon (on my left ankle). I'm a tiny bit nervous and also very excited! This is my Christmas present to ME! Merry Christmas everybody! Hope there is comfort and joy in plenty for you and all your loved ones. Merry Christmas to all my family of MOMers!! Hope everyone gets what they wish for and that they are able to spend time with family and loved ones this holiday season!! We don't have tree, but we do have our collection of Santa figurines and other things on our mantel. Maybe, I'll take a picture of them and put it up later. This weekend, we get to go to hang out with my mother's family for the annual Christmas party. Then, it's all kinds of Christmas fun with the family on my father's side of the family at my grandmother's house for Christmas Eve and Christmas Day. We have a small 2ft tree that HAD a few pink ornaments. The tree was on the floor this morn. Not sure where the ornaments are. The joy of having 6 six month old kittens. We also have a 4ft tree with just a few non-breakable ornaments. 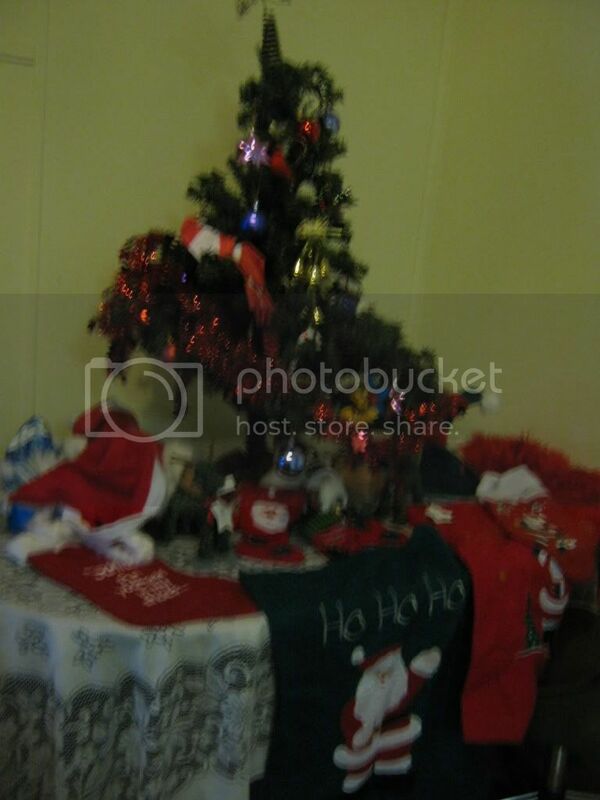 That tree is still up, althou the angle tree topper was on the floor a couple of days ago. Hope everyone has a wonderful holiday & a great new year. Merry Christmas to all! Hope you have happy holidays. I found most of the pink ornaments. We now only have the larger tree up. I gave up on having the smaller tree up. Since this is our first winter in the new house, we're planing on having two trees, the 2 - meter one in the living room, and the smaller one outside. We're also planing on decorating our house with lights. Considering it's high on a hill above all the other houses in that area, the house shouldn't be so hard to find anymore, or to explain it's location:''Just follow the blinking lights on the hill''. Merry Christmas, Blessed Yule, and Channaka Greetings to all! Finished my shopping today (will do all wrapping on Monday) Baking tomorrow. Putting tree up tomorrow. Merry Christmas to one and all, and a happy and blessed New Year!